More sets - You can learn more firing modules to the same transmitter. Of course you can't direct control more than 24 different cues if the transmitter has 24 pushbuttons only. But you can create sequences or you have to fire the same cues on more modules together. Can I programme different sequences on two modules but start them with one button only? Yes, of course. It's possible to upload different programmes into the modules, but the show can be started with one button only. MerlinShot - Small firing module with programmable 4 cues. 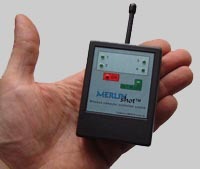 This unit can be used separately with the MerlinStep's transmitter or you can combine it with the MerlinStep module. Has internal 9 VDC battery and fires with 25 VDC impulses. Stand-alone sequencer - You can use the MerlinMatch as slave and with each impulse from the MerlinStep you start sequence on the MerlinMatch. If you connect the MerlinMatch parallel to the e-match on MerlinStep's cue, you loose no cues! 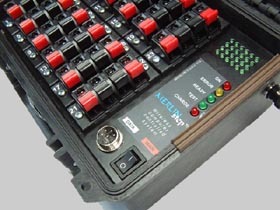 The MerlinStep product is a compact package of all electronic components needed for the wireless firing. With the product we can fire either small fireworks or incorporate it into big fireworks for the firing on inaccessible places. Firstly, the package consists of the control-module pair where the handling is as demanding as changing the programmes on television with the remote control. Working frequency is in the 868 MHz band (optionally 433 MHz), transmitted data are secured by a floating code with a high-level safety. Technical high-frequency parameters correspond to the norms for transmission in this band and the range of the package complies with it. In order to reach a reliable transmission, we decided for this rather high frequency where there is not high interference of other transmitters. In spite of this, the overall range of the control is given not only by the distance from the firing module, but also by wall shading (reinforced concrete), environment and even by the way we hold the control in our hands. During tests a reliable connection was reached in the distance of more than one kilometre in open space, which is sufficient enough for a common firing of fireworks, because we need to have the location under a visual control. We cannot fire the explosives if somebody is moving, though by mistake, in the safety area of firing. Switch it on, switch the firing voltage on, press a button and fire. That is all you have to do. We do not have to own a PC, we need not to do anything. The only thing we have to remember from time to time is to recharge the batteries. However, the package contains chargers designed for it so that it suffices to plug them in and have it charged over night. If we do not want to fire each position with a press a button on the control, we can set up simple sequences on PC that we then record into the firing module. We can combine several sequences with a direct firing of the position corresponding with a given button. 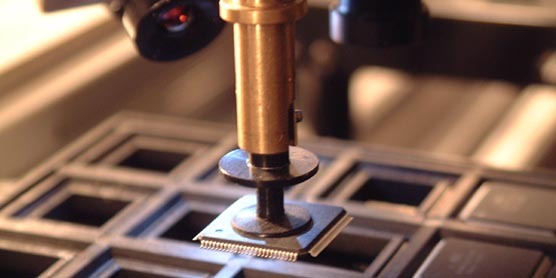 The sequences can be saved to disc of the computer and used again. Even after switching off the computer, the firing module remembers the saved data until we change them via PC again or delete them. It means we do not have to take a PC to the location. If 24 positions are not enough, but we do not want to get a more expensive and modular system, then MerlinStep offers a possibility, in case of buying for example two packages, to teach two firing modules to "listen" to only one remote control. Thanks to this we can launch a sequence of firings on the first module by pressing for example button number 1 and by pressing button number 2 we will launch a sequence on the second module.